What does it mean to be an Irish writer in New York? It’s certainly not a new question—if you’re here reading the IAW&A blog, then odds are you’ve grappled with at least two if not all three parts of the equation—but it’s one that continues to fascinate and inspire. In The Writing Irish of New York (Lavender Ink), author, playwright, and filmmaker Colin Broderick brings together a wide range of Irish and Irish American writers to reflect on how the city has influenced their identities and their work. Many of the names will likely be familiar, including Billy Collins and Colum McCann, as well as IAW&A stalwarts Larry Kirwan, Kathleen Donohoe, Maura Mulligan, Honor Molloy, John Kearns, and of course Malachy McCourt. 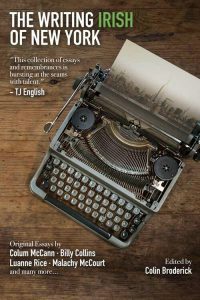 For those readers who are newer to the city, the anthology paints a picture of New York through the decades, a place of crooked cops and cold water flats and windowless clubs open 24 hours a day; a place where you could thrive as a writer, if you weren’t afraid of the hustle and took just the right amount of risks. But it isn’t all nostalgia, and most if not all of the essays touch on some element of that unholy Irish trinity: poverty, alcoholism, and mental illness. The ghosts of Oscar Wilde, Brendan Behan, and Maeve Brennan loom large throughout; in her contribution, author Luanne Rice recalls at nineteen being told that the key to a successful writing life was to memorize the poems of Yeats, and “don’t become depressed and alcoholic like Maeve Brennan.” Other authors pay tribute to less tragic influences: a nun-in-training (Mary Pat Kelly) writes letters to a young Martin Scorcese, and a lifelong friend of Frank McCourt (Dan Barry) receives a posthumous invitation from the man himself. In addition to questions of identity, many contributors touch on the more practical considerations of the writing life, including juggling work and family, establishing a routine, and navigating the complexities of agents and publishers. Our own Kathleen Donohoe reminds readers that it’s never too late to make a career as a writer; her decade-long journey to publication included three manuscripts, two agents, and more than 75 rejections before she eventually signed a deal for her novel Ashes of Fiery Weather. You can order The Writing Irish of New York from Lavender Ink or from Colin Broderick’s website.